From Aitken’s Salmon Creek Garden, 2013: VISIGOTH (M. Smith '13) TB, 39" (99 cm) M, 7 buds. 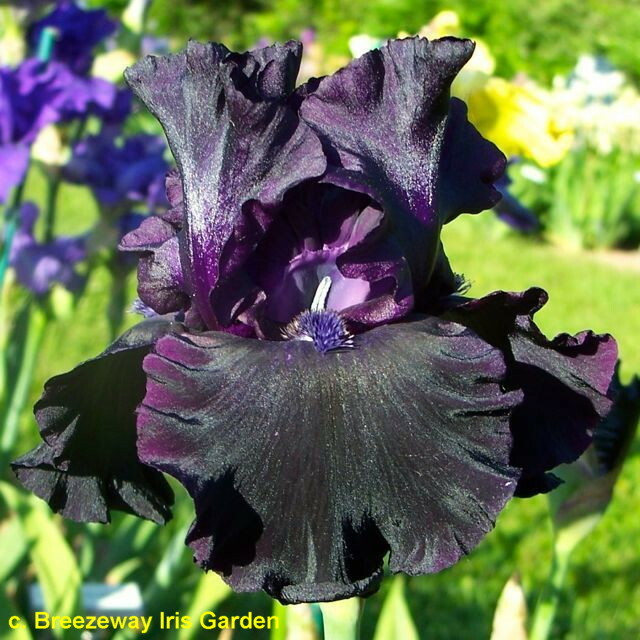 Tall, ruffled black with pronounced fragrance. A barbarian presence in the garden. Standards are glittering black silk in cold weather, showing a black-violet sheen in late day warm sunshine. Style crests are black with very dark violet midribs and purple sides, shading to grayed lavender bases. Falls are matte, midnight black with a few lavender veins around black beards, tipped darkest violet at ends, shading to deep burnt umber in throat. This cross was for possible black plicatas, as both parents have the recessive genes. Will certainly try another generation. Sdlg. #06-21 B: (Bubble Bubble X Obsidian) - photo:front cover - $50.00.